John G. Nicolay on left with President Lincoln and John Hay taken November 8, 1863 by Alexander Gardner in his Washington studio. Image from the Library of Congress collection. President Abraham Lincoln sent his secretary, John G. Nicolay, as his personal representative to the 1863 treaty council with the Utes at Conejos, Colorado Territory. Nicolay arrived in September and spent a month touring the Territory. He arrived at Conejos on October 1, 1863 to lead the team of government representatives that included Territorial Governor John L. Evans, Dr. Michael Stech, Superintendent of Indian Affairs for New Mexico, plus Indian Agents Simeon Whiteley and Lafayette Head. Fifteen hundred Tabeguache Utes (Ouray’s band) turned out for the treaty council. 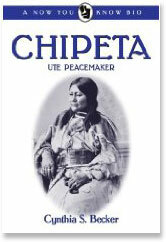 Only three Mouache chiefs and one Capote chief attended. The Weeminuche and the northern Ute bands did not participate. A treaty was concluded on October 7, 1863. It was primarily an agreement with the estimated 4,000 Tabeguache Utes, who gave up their lands east of the Continental Divide. After the agreement was made, Nicolay presented silver peace medals bearing President Lincoln’s image to seven chiefs, including Ouray. These were men Nicolay counted as most cooperative. The treaty Nicolay negotiated was ratified, with amendments, by the U.S. Senate on March 25, 1864, and accepted by the Utes on October 8, 1864. Arnold Schwarzenegger was the voice of Lincoln’s Bavarian-born secretary, John G. Nicolay, in the 1992 ABC documentary Lincoln (Richard Zoglin, “Trying To Hype History,” TIME, December 28, 1992). Helen Nicolay wrote a biography of her father: Lincoln’s Secretary (Longmans, Green and Co. 1949; reprinted Greenwood Press, 1971).